We've been playing with Magformers for the last week or so, and I've been really stunned at the amount of play value in our Wow Box. 16 magnetic construction toy pieces for children aged 3+ that allow you to build all kinds of structures and vehicles in moments. Now Magformers have very kindly offered a Wow Box for one of my readers. 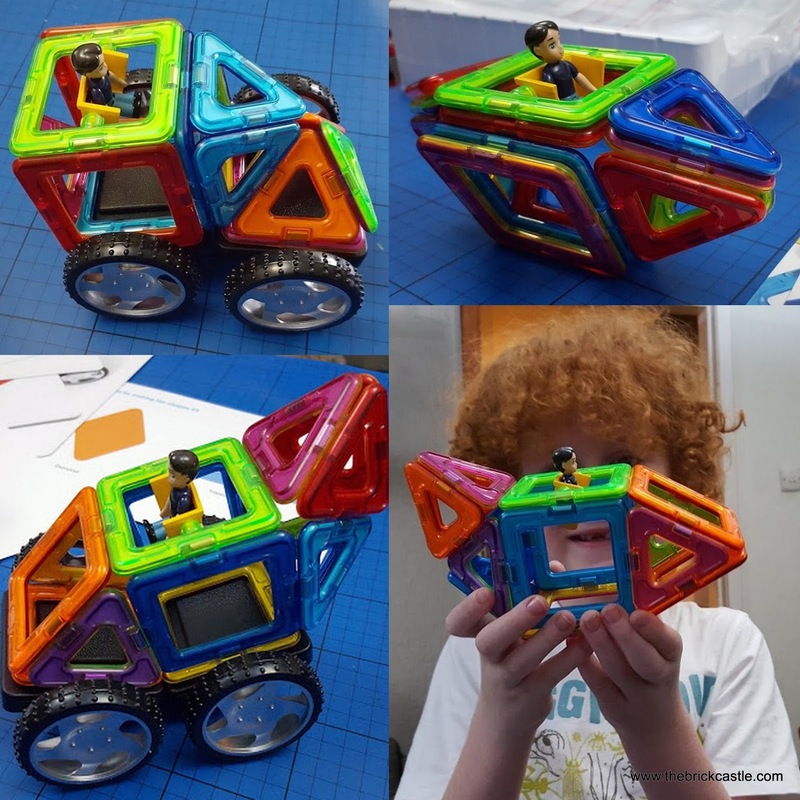 The Wow Box is ideal for building vehicles and comes complete with wheels and a driver/pilot/passenger who is designed to always stay upright whichever position he's in. The giveaway is a late addition to my Christmas Present Giveaways, and will end with the others at midnight November 30th, so that you can have your Magformers ready in plenty of time for Christmas. Magformers models only take minutes to build, and moments to take apart, so it encourages your child to rethink their designs and add modifications. They aren't frustrated or disappointed when their model suffers a breakage as it's so quick to put back together, and there are no tiny pieces to lose under the sofa. 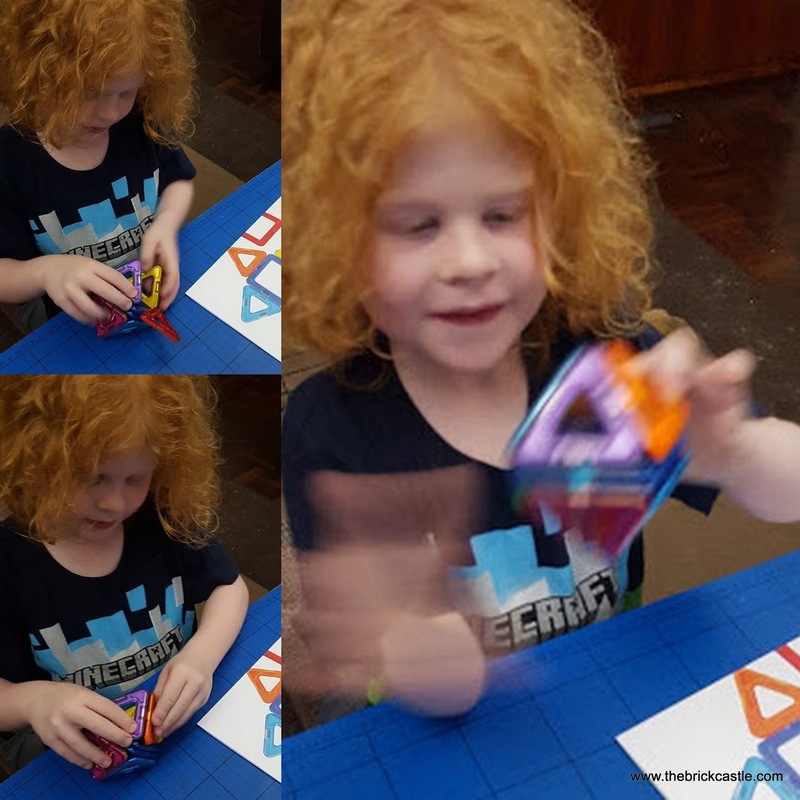 The Wow Box also includes a massive array of design ideas to get your child started, including a staggering 20 different mini-cars. Magformers have been a massive hit here, and it's easy to see why they're so popular in schools, as not only are they brilliant for creativity and teaching scientific principles, they're really strong and will withstand a lot of play. The Magformers Wow Box is available now priced £29.99. 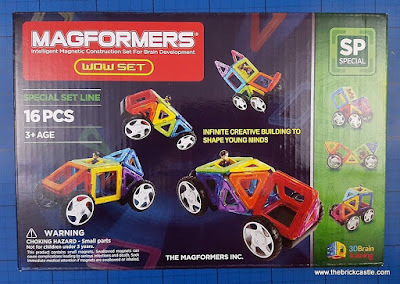 For your chance to win a Magformers Wow Box please enter using the Gleam form below. There are no mandatory entries, but each extra task completed will earn extra entries into the draw. The giveaway will end at midnight November 30th for Christmas delivery. UK entrants only, please see terms and conditions at the bottom of the Gleam form. To see all 16 of my Christmas Present Giveaways please visit my giveaways page. Kate Middleton so I could spend time with a furture king and his sister and get pampered for the afternoon! My dog as I'd love to see what he really gets up to all day! a squirrel so I could experience climbling and flying through the trees. i would magnet myself to the hubby, he could then see how being a stay at home mum isnt as easy as he seems to think. I never know how to answer these types of questions, but I have always fancied finding out what my son gets up to at school, so would choose him. Not sure he would want others to see me so would have to be invisible at the same time! Olly Murs - I love him! David Attenborough , I think he would be the most fascinating person to talk to. If I could find the Prosperity Fairy, I'd attach myself to her! But since I have been unsuccessful in locating her to date, I would, instead, attach myself to Michael Kitchen because I rather fancy him. Very cool! Anything that encourages imaginative play and doesn't have annoying electronic noise is a winner in my book! Love these Stan has got some magnetix, just never enough once he's made a model he's ran out! :D I do forsee that when my boys get a bit more advanced they'll want more and more! out of school saying he's done nothing, so would be great to see what he does! I think that I would attatch myself to Robbie Williams. Then I would let him entertain me!! I would magnet myself to our Jack Russell, Maggie because I am always intrigued about what she gets up to, when we are out. My mums cat, Jack, I would love to know where he goes and what he gets up too!!! No chance of that! I would not like it even my husband or kids. I think I'd like to attach myself to my dog, just to see what he gets up to! The Queen, I'd like to see what she does! My 4yo. I ask what he did at school - nothing. Every day. I'd love to be a fly on the wall! David Cameron - he's got a tricky job at the moment, meets amazing people and goes to amazing places - he's quite easy on the eye too ! i will sound geeky but to prof. Brian Cox! i love science so could listen to him for the whole afternoon! I would stick myself to Hayao Miyazaki who is the creator of the Studio Ghibli animations so I can watch him at work. Joe Manganiello, for obvious reasons! Keith Lemon-be a laugh a minute! Tom Cruise, to find out what his life is really like - is it totally weird? Or more weirdly, totally normal? I would love to be attached to a hang glider - it must be an amazing feeling soaring over the countryside. My cat, lots of sleep and I do wonder what she gets up to all day. The queen so i would know what she does all day! My kids! I would just love to see what they get up to at School/Nursery! Perfect Christmas present for my kids. I am so thankful I have seen your blog today, I now have idea what to buy for this season.